High dynamic range photography is generally compatible with multi-metering, which evaluates all the light sources in a scene. You may need to switch modes, however, to take into account very bright or dark areas. Your digital camera has the ability to measure the amount of light in a scene and calculate the proper exposure. Most of the time, the camera meters the scene when you press the shutter release button halfway down. In this way, you can take a reading and then alter the controls to change the exposure. There are several different metering modes. Your camera might have one of several types such as multi-metering, center-weighted, spot, partial, or average. 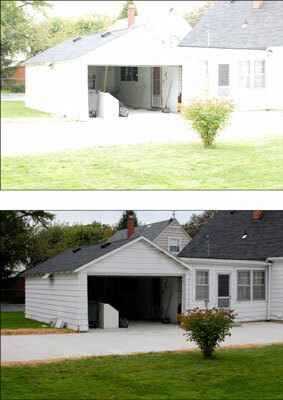 This figure shows two shots of a garage. The lighting is somewhat complicated. Spot mode — centered on the dark garage — raises the exposure so the interior can be seen but at the expense of everything else. Matrix mode leaves the garage too dark while everything else looks pretty good. HDR photography is more than just “point and shoot.” It involves understanding exposure and using your camera to set up and capture a wide dynamic range of light through brackets. If you are familiar with these concepts, HDR isn’t overwhelmingly different. If you are new to photography, HDR will help you learn a great deal.